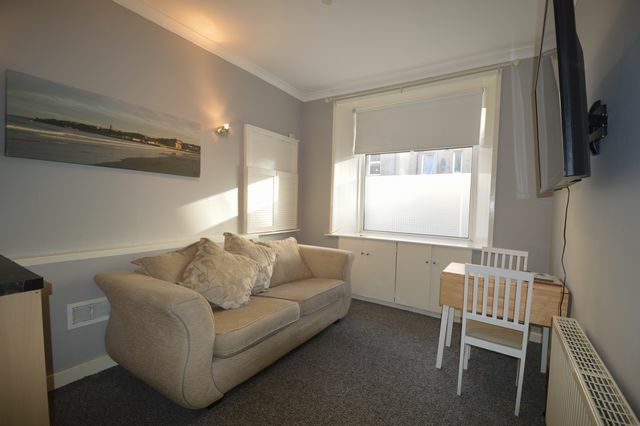 Well presented 1 bedroom ground floor flat in very central location and on major bus routes both into Edinburgh city centre and out towards the west of Edinburgh. The property comprises an open plan living room/kitchen which is neutrally decorated and carpeted in the living room area, with laminate in the kitchen. There is a good level of furnishings with the kitchen fully equipped with all daily utensils. There is a washing machine, oven and hob, microwave and fridge. The bedroom is a good size with built in cupboards and wardrobe and has neutral decor and carpets. There is a separate toilet and shower room, all renovated to a high standard. The property benefits from GCH, door entry, double glazing and plentiful street parking. It also has a smart TV and is covered by a TV license, included in the rental.